When a pair of adult (9-12 months old) Ringneck Doves are placed together it will usually take anywhere from a couple of weeks to a couple of months for them to begin the breeding cycle if they are compatible (rarely a problem). The pairing process begins almost immediately when the birds are placed together. The male begins to do all he can to impress the female. Ringneck Doves do very well breeding in a ratively small cage. Ringnecks are not typically community breeders so one pair per cage or flight is advisable. If the flight is large enough for separate territories to be established then a few pair will usually do ok together. I raise my Ringnecks in cages that are just "18 H X 18" L x 24" W. These are pretty close quarters but they typically do well. Introducing a pair of Ringnecks to a cage is an important time. Not only are they getting used to each other (if never before introduced), they are also getting used to the cage. It is good to have a nest in place about the time the birds are put into the cage so there is not any cause for alarm later after they are already getting used to the cage. Begin by placing a nest container in the cage with the pair of birds. No doves are known for their nest building expertise. Ringneck Dove nests are generaly flimsy structures with just a few twigs seeming thrown together. It is important that you help them by placing "nesting containers" in the flight for them to buld nests in. Nesting containers can be elaborate or simple. They can be constructed of wood or could simply be an old tupperware dish. I use a nest pre-formed out of paper that I get from a poultry supplier. 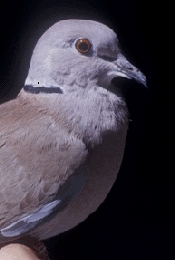 Most doves prefer open nests, not covered. Nest building takes place throughout the breeding cycle. The male does most of this by simply dropping a few provided twigs or bits of hay into the nesting container. Male Ringnecks primarily display their interest in a female by making a long drawn-out sound called a coo. This coo-ing generally takes place in three sitiuations, all of them part of the courtship. The first cooing situation is when the male simply sits on the perch and coos to let the other doves know that he is "in the market." The second situation when the male has spotted the female he is interested in and is doing his best to convince her he is a nice guy. He is showing off. This is known as the "bow coo." The male coos with the same sound as the first situation but it is accompanied by rythmic bowing before the female as though he is worshiping her (go figure). Once the female is convinced, the male then will climb into the nest and coo with the same sound again but this time he is in what looks like a permanent "bow." He kind of "flutters" his wings very lightly to get her attention and let her know that he has found a suitable nesting sight. Click Here for a 14 second video clip of the bow coo (video by Greg Sweet). Click Here for a 5 second video clip of the wing flutter. The actual copulation usually takes place sometime between the bow coo and the wing fluttering. It takes a week or so for the eggs to develop. All this time the male is also "driving" the female to the chosen nesting site. He will literally chase her to the nest. This usually looks more rough than it is but on occasion injury may result so it is wise to keep an eye on the pair. Ringneck Doves lay two eggs which hatch after 14 days. The young are then fed by the parents what is called "crop milk." Crop milk is produced in the crop of the parents and the young put their beaks inside the parents throats and slurp it down. Within a few days the parents add seed to the diet of the young. The young then leave the nest three to four weeks later. It is not uncommon to see some pairs lay all year beginning on a new clutch every six weeks. This really is not recommended because it is unhealthy for the birds. Feeding and taking care of young really takes its toll on the energy of the parents. After three or four clutches, the breeding for that year should stop by either removing nesting materials or separating the birds. There is some discussion that some of the color varieties are less prolific than others due to the gentetic load they may carry. I have had this problem with Diamond Doves and Zebra Finches in the past but not much problem with Ringneck Doves. It often seems as though the more rare varieties "know" that we are waiting for them to breed and so they get nervous. There is probably some truth to this. Too much attention can be a problem. It is wise to just stick to the daily watering and feeding and leaving them alone to "do their thing."